InterPlay uses the Collection Editors to display the Collection objects. You can create several Editors for each Collection Type and you can use the same Editor for several versions of the same Collection Type. 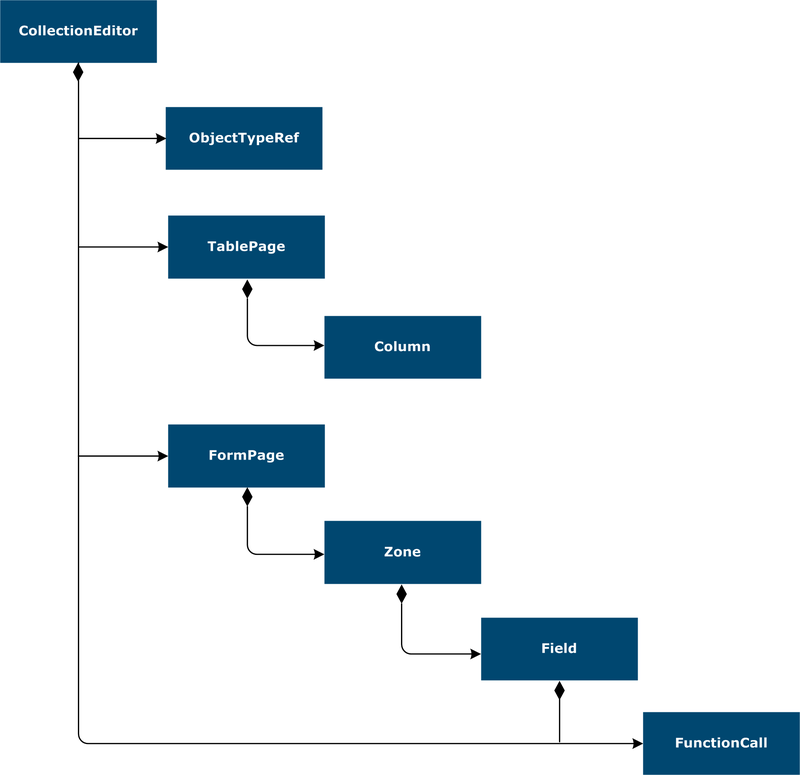 The structure of the Collection Editor is defined as follows. On the Details tab, enter the Collection Editor general information and select the Collection Type the editor must be associated with. See Specify Collection Editor details. In the table on the Object Type references tab, add references to the Object Types. See Specify Object Type references. On the Table Page tab, add Table Pages to list the objects of the different types. See Create a Table Page. For each Table Page specify Table Page details and Column properties. On the Form Page tab, add Form Pages to display the properties of the Collection and its singleton objects: Header and Footer. You must divide the Form Page into Zones that contain Fields. See Create a Form Page. In the table on the Function Calls tab, specify the function calls for the Collection Editor's fields. See Specify the function calls. In the table on the Object Type references tab, add references to the Object Types. Click to generate the editor from existing formats. Designer generates a Table Page per Object Type reference and a Form Page that contains the Collection Type properties. Editor labels are stored in the dictionary specified in the Collection Type. Refine the created objects if necessary. For Collection Editor fields, specify the function calls in the table on the Function Calls tab. To generate a default editor automatically when the collection is edited, check the option Generate default editor in the corresponding collection type. The generated Editors have a two-column layout. The default field property values are defined in the global UI settings. If a field has multiple possible values, a combobox is generated.